This command installs the CDT plugin and the DVT CDT Integration plugin as well. 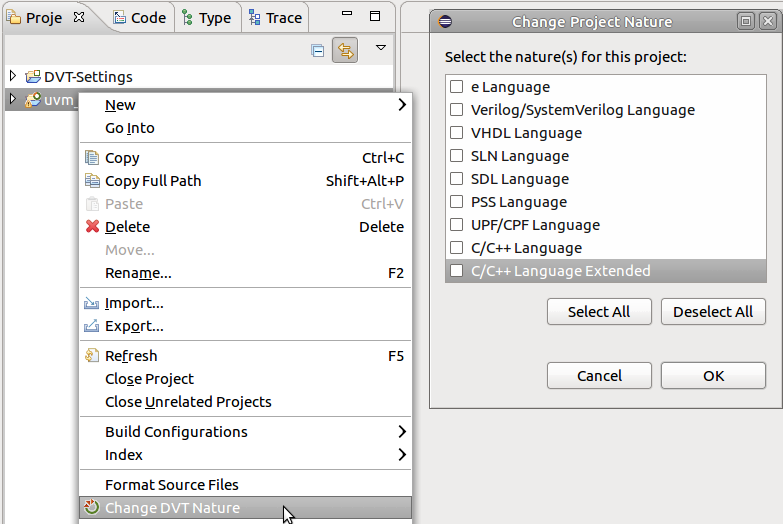 The C/C++ sources located outside the project directory are automatically linked inside the project under the DVT Auto-Linked folder. The C/C++ sources located inside the project but not included by the C/C++ top files specified in the build configuration are automatically excluded from the CDT build. +dvt_gcc+</path/to/gcc_executable> Specify location of GCC executable (used when scanning for included C/C++ files and injected in the CDT project configuration). +dvt_gcc_args+"args string" Specify extra arguments for the GCC executable (used when scanning for included C/C++ files and injected in the CDT project configuration). +dvt_gcc_timeout+<timeout> Timeout in seconds when running GCC. Set 0 to disable timeout. Default: 40 seconds.